In cities where most of us are living now, we cannot of course, white-wash our flats every year. But we can definitely put the effort to have a thorough cleaning of our flats, remove old junk and create cleaner spaces. While cleaning, we should take special care of cleaning wash areas, sinks and other hidden corners of our houses where germs tend to accumulate. Even though we have harried lifestyle nowadays, we should always make regular house cleaning a habit which is part and parcel of our life. By associating cleanliness chores with festival, Pongal Bhogi makes house cleaning a part of fun and celebration and encourages us not to think cleaning chores to be tiresome activity. There are many good side effects of regular house cleaning such as getting rid of Cockroaches. Cockroaches bother most people. Most kids and even ladies get scared of them. Cockroaches are more than social embarrassments. In reality, they are carriers of many diseases. As Cockroaches crawl into your kitchen, they bring dangerous germs and bacteria from dirty drain, and become carriers for these germs which are known to spread diseases like Food Poisoning, Typhoid, Cholera, Diarrhea, Dysentery and many stomach diseases. Fortunately Godrej has come up with a very good specialist cockroach killer product called LAL HIT. All you have to do is apply the chemical into deep corners and cracks of your kitchen as part of your monthly kitchen cleaning process. You can have a weekly schedule at key areas. The unique features of the LAL HIT is its Deep Reach Nozzle which can ensure that the product can be inserted into cracks and holes and ensure that the spray reaches even those cockroaches which typically hides deep in the cracks of the buildings where cockroaches tend to hide and escape from otherwise regular cleaning steps LAL HIT is the only solution that can eliminate even the hidden cockroaches and keep the family safe from diseases like Food Poisoning. Pongal Bhogi should also be used as an occasion for involving kids and teenagers in household cleaning. This will also help us educate them and make cleanliness habitual for them. What better way can there be other than Pongal to introduce LAL HIT into our households to make our houses health and clean? We also have to remember that products like LAL HIT have to be used periodically and not occasionally during festival seasons. In Villages, people make Poli sweets as part of the Pongal celebrations. 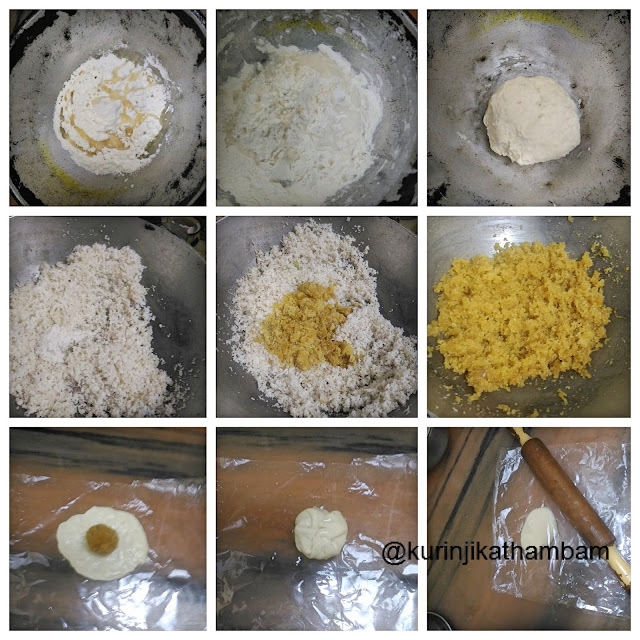 Poli is quite easy and quick to make and needs only readily available ingredients. Try and make Poli at home to make Pongal all the more special. Preparation Time: 15 mins | Cooking Time: 5 mins | Yields: 10 nos. 1. In a wide bowl, add maida, salt and oil/ghee. Mix them well with your fingers. 2. Then add water little by little and knead into very soft dough. Cover the dough and keep it aside for an hour. 3. Heat the ghee in a pan, add grated coconut and fry for 2 mins. 4. Then add the crushed cardamom and grated jaggery. Keep the flame at simmer. 5. Jaggery starts to melts, so that the stuffing becomes watery. 6. Then slowly the stuffing becomes thick. Stir occasionally to avoid to sticking at the bottom of the pan. 7. Remove from the heat once the stuffing reached the thick consistency. Allow it to cool down completely. 8. Divide the dough into big lemon size balls. 9. Divide the stuffing into equal number of dough balls. 10. Apply oil on the clean plastic sheet. Keep the dough ball on the sheet. 11. Press the ball using the fingers to make small circle. 12. Now keep the stuffing ball at the center of the circle and close the stuffing with the dough. 13. Now close the ball with plastic sheet and make a thin circle using your fingers or with rolling pin. 14. Heat the tawa, place this poli over the tawa and pour oil or ghee. Cook both sides till it some dark spots comes. 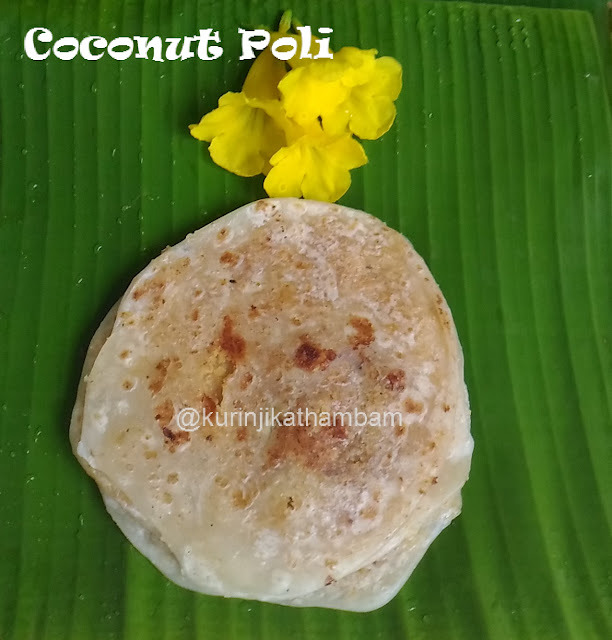 Tasty and mouth watering coconut / thengai poli is ready to serve. 1. Adjust the sweet level according to your taste.